The old wooden stand that I made twenty years ago (to display bonsai trees on) finally rotted and collapsed leaving me with a narrow space that was just gathering junk and I decided it had to be put to better use - so I built a new frame. 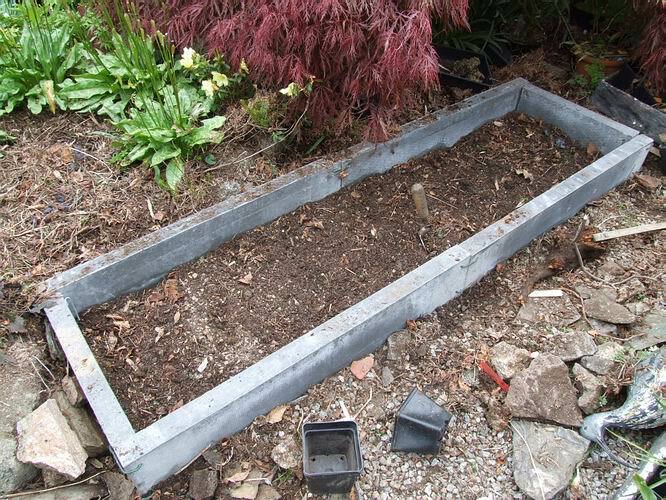 I bought from the DIY store five lengths of concrete edging, 915mm (3ft) x 150mm (6") which will fit in the space perfectly and this is a tried and tested method that I have used for other beds, such as one of the erythronium plunge frames. 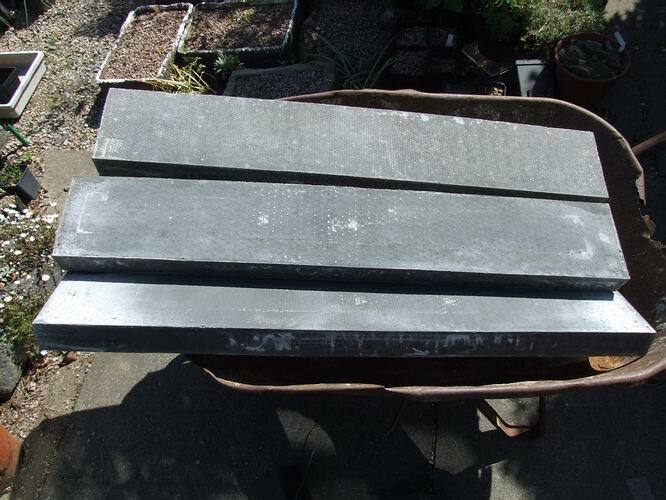 Because I have only a narrow space available my first task was to split one of the slabs in half which is easily done with a hammer and chisel. First I drew a line on both edges and sides marking half way then I carefully went round with the chisel, starting on an edge, and made light hammer strokes until I had a small indented line all around the intended cut. 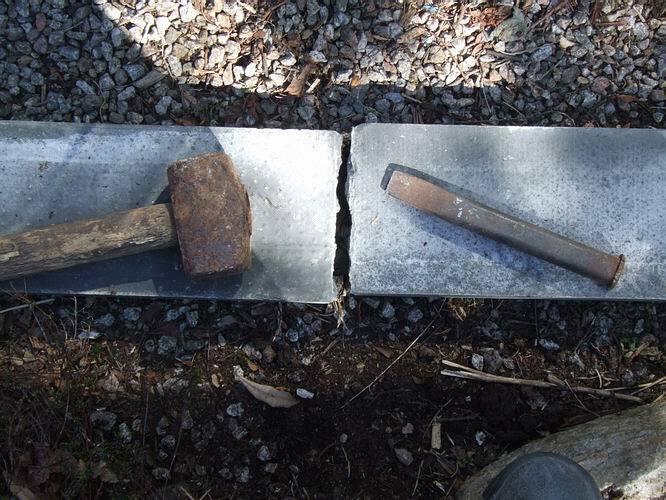 I repeated that procedure moving my chisel around after each strike with the hammer until after about the fourth time around the slab split neatly in two. Next I drilled two holes on each end of all the slabs. 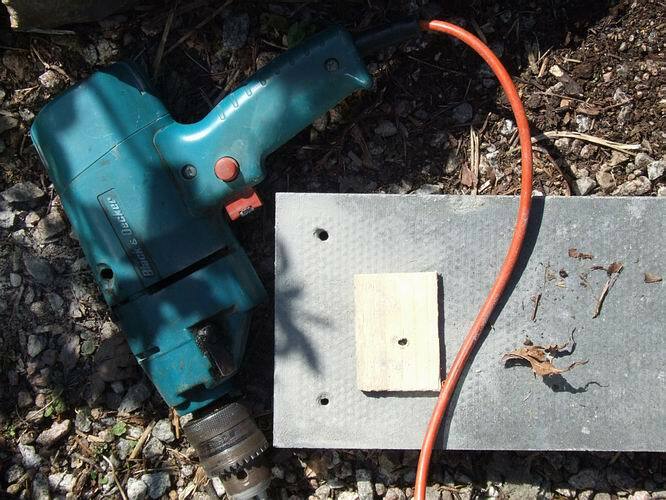 I used a cardboard template to mark where to drill the hole using a masonry bit and my small DIY hammer drill - I only took about 15 minutes to drill all the holes. 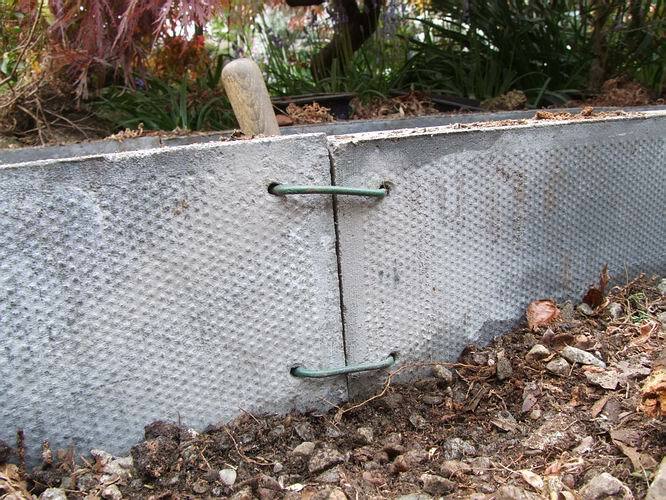 I could then join the slabs using plastic coated fencing wire as staples. Poking it through the holes from the outside and bending it over on the inside to hold the slabs together. A similar method is used on the corners and a sprit level and set square ensures that I have assembled a reasonably accurate rectangular and plumb bed. I am not entirely sure how I will utilise this bed but I am sure that it is for bulbs. 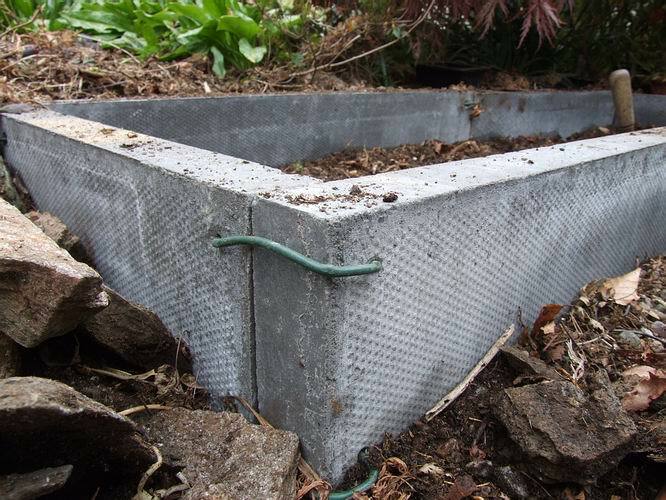 As you can see it is an ideal size to fit in these plunge baskets and that is how I have used the other one that I made a number of years ago for the erythroniums. 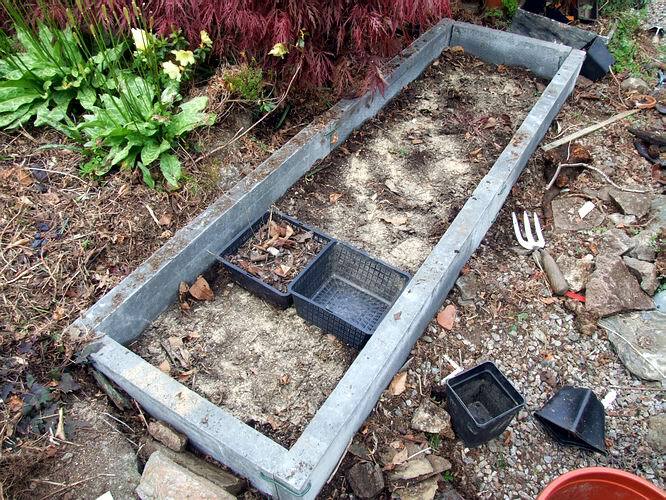 I have it in mind to plant out spare crocus, fritillaria and narcissus bulbs directly into this bed when I repot……. but keep watching the bulb log to find out what I do and how it performs. 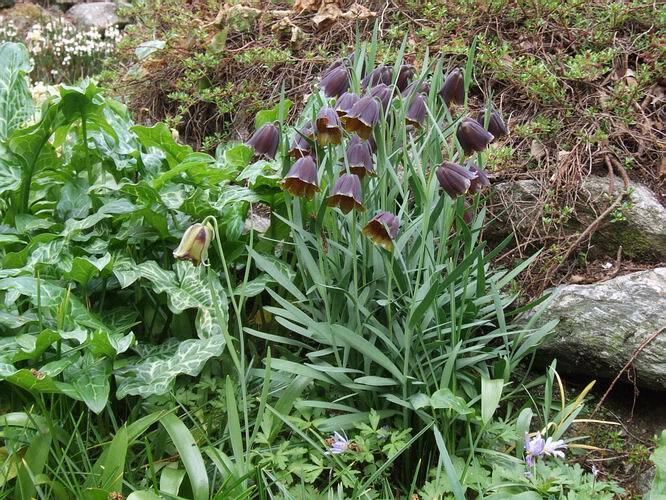 A quick walk around the garden to see what bulbs we have in flower just now reveals our own compact form of Fritillaria pyrenaica, which we named 'Braeside', is still in flower. 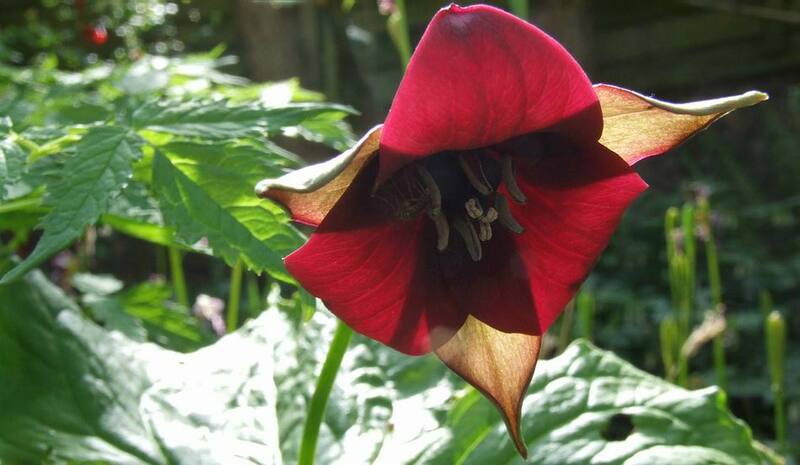 It increases well in the garden, where we grow it in plunge baskets which means we can lift and divide it on a regular basis but like most forms of Fritillaria pyrenaica, it seems to resent being grown in a pot under glass for any length of time. Just opening is the darkest of all frits; Fritillaria camschatensis, this is the Eurasian form with no green at all showing on the petals. 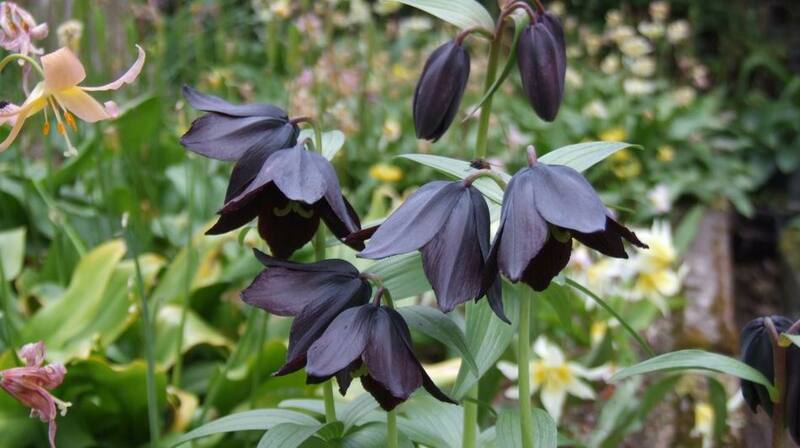 While most of erythronium flowers are well past now we have a small group of late flowering forms. I have wondered if it is the position that they are growing in that causes them to flower that bit later than the others but there are others close by which flowered weeks ago. On the left is the pink E. revolutum and the cream flowered E. californicum while the right hand picture shows E. oregonum. This year I hope to get around to splitting these clumps and I will try them in another part of the garden and then I will find out for sure if they are late flowering or if we just have a cold micro-climate in this small part of the garden. Close ups of the flowers lets you see how closely related these two species are - take away the colour and you would be hard put to tell them apart. A nice yellow form of Fritillaria affinis is growing up through a rhododendron. This is as a result of me scattering rice grains around with the spent compost at repotting time and it is very welcome as I lost this form a number of years ago, when all the pots I had of it, rotted off simultaneously. I originally raised it from North American Rock Garden Club seed when it was distributed as F. pudica - same colour but otherwise two very different species. You can also make out in the background of that picture, through the rhododendron, one of our groups of pink Trillium grandiflorum - I give you a better view of it on the right. 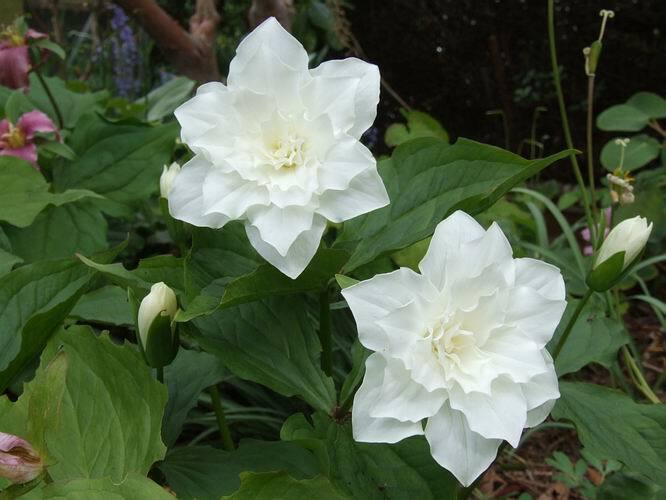 Always a bit later into flower are the double forms of Trillium grandiflorum and this is one of our clones - I do not have names for any of them. Many of the Trillium erectum complex are in flower just now including this beautiful one which I think may be Trillium sulcatum. Having read the books over and over and continually looking at the plants we grow I was relieved to read in John Lonsdale's excellent article in the Rock Garden that he, too, finds them an unruly bunch that just do not want to conform to the nomenclature that has been applied to them by various authors. Another form that group that might be Trillium simile but then it might be a cream from of Trillium sulcatum, or it could be………..!! !